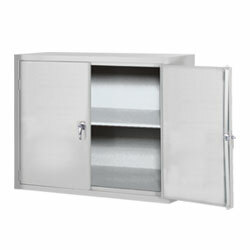  Boltless ready-to-assemble wall cabinet snaps together without the use of any tools. Two-point locking system. Shelves adjusted in 2” increments. The keyless electronic coded locking handle is available with two passwords, and keeps a record of the day, date, and time of when the cabinet is accessed. An exterior battery pack can be plugged into the keypad and also a key that is accessible on the keypad. Available in black, putty and dove gray. Arrives ready to use. Shelf adjusts in 2" increments to accommodate multi-sized items. SPECIFY COLOR: GY - Gray, PY - Putty. FOB TENNESSEE.